Roughly 200,000 people gathered in the streets of Kiev Sunday, as the Ukraine protests entered their fourth week, in some of the largest demonstrations the country has seen since the Orange Revolution in 2004. Across the city, protestors have settled in camps and created barricades, as all the while the pressure heats up from the outside as well — a day after the European Union enlargement chief Stefan Fuele announced on Twitter that Brussels was suspending talks with Kiev, US senators John McCain and Chris Murphy joined the demonstrations to pledge their support for the anti-government protestors. The protests that have taken over the country over the last few weeks began as a smaller pro-EU rally, sparked by Ukrainian president Viktor Yanukovych's decision to back out from signing an Association Agreement with the European Union — a deal that has not only been in the works for a while, but would've put the country on the right track for EU membership — over fears of hurting the country's relation with Russia, with whom the Ukraine has an open economic zone agreement. Essentially, the Ukraine is being pulled in two different directions: the freedom of movement offered by an association with the EU vs. the valuable trading partner offered by Russia. As has been the case in Turkey, Egypt, and Brazil, the protest grew significantly after a violent police crackdown on protestors last Wednesday, quickly erupting into a full-scale anti-government movement. Further fueling the unrest, the EU enlargement chief Stefan Fuele announced on Twitter early Sunday that he'd put the trade-and-political agreement on hold, saying that Yanukovych's words and his actions seemed "further and further apart." International support for the anti-government protestors has also increased, with U.S. senators John McCain and Chris Murphy making an appearance in the rallies Sunday to express their support for their European ambitions and threatening economic sanctions against the Ukrainian government if more violent police crackdowns occur. "People of Ukraine, this is your moment, this is about the future of Ukraine, the future that you deserve," McCain said. "The free world is with you, the U.S. is with you, and I am with you." “Ukraine will make Europe better, and Europe will make Ukraine better,” he added. Opposition legislators are gearing up for a no-confidence vote early next week to bring down the government. 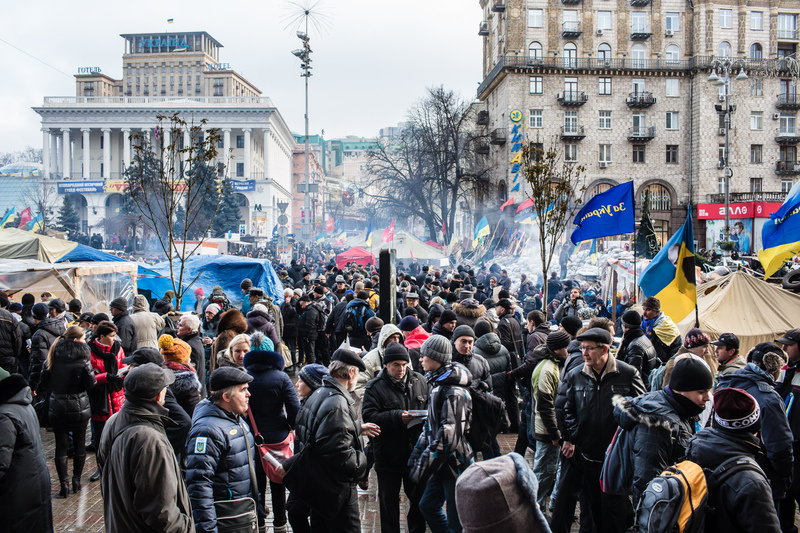 "Dismissing the [government] is the minimum that opposition have to do to bring these protests to an end," said local political analyst Volodymyr Fesenko. If that fails, there's no sign that the demonstrations will slow down — protestors are threatening to stay on the streets until Yanukovych either gives up or gives in.